Ings Mill and Dale Street from Tumbling Close and the Three Arch Bridge. The Mill was also known as Denton’s Mill. The lane with the stone wall on the left was known as Blue Clay Lane and Holy Trinity Church stands in the left background. Ings Mill located in Dale Street was built in the second half of the 19th century, probably around 1870 for the Ossett Mitchell family, later there were early 20th century structural alterations. In 1881, the failure of the woollen cloth making business, operated by Seth Mitchell, at Ings Mill was reported in the local press. In December 1881, the situation was made worse when fifty or sixty power loom weavers at Ings Mill went out on strike because of a reduction in their wages. However, a week later the dispute was settled when the weavers returned to work. 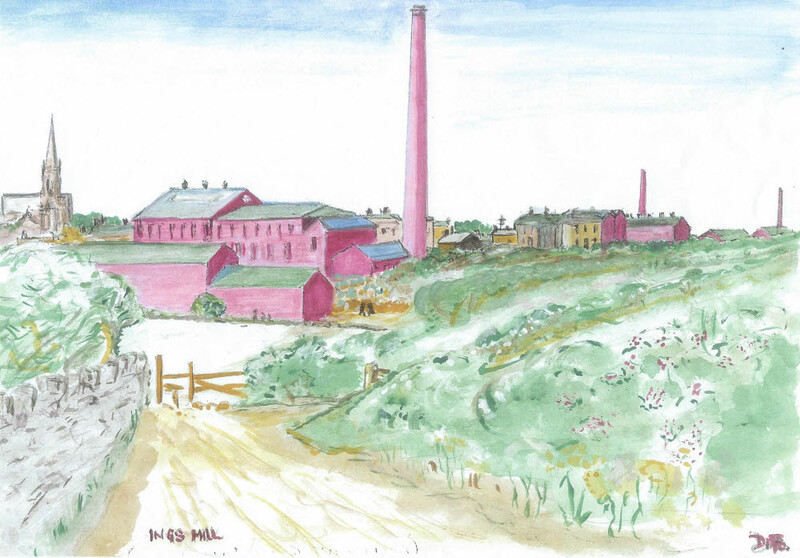 The mill was occupied in 1882 by J.J. Mitchell and in the same year, Mitchell & Co., Ings Mill, Ossett were fined for employing three women who worked through their dinner hour against the regulations laid down in the Factories Act. Ings Mill was extended in 1887 with new buildings and J.J. Mitchell also took over Healey Old Mills. Mitchell & Co. were still in business in 1901 and were listed as woollen cloth manufacturers.